← The Slow Wheels of Justice—Or Is It a Treadmill? 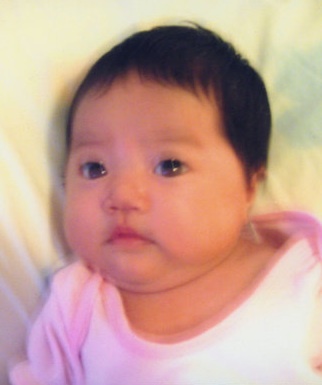 While attorneys on both sides claim partial victories, supporters of Hang Bin Li say they are “devastated” by the mixed verdict delivered last Friday, when a New York jury found Li innocent of murder but guilty of manslaughter in the 2007 death of his infant daughter Annie. The news was especially shocking because no one had expected a verdict so soon. During nine days of testimony over three weeks, the jurors heard from nine medical experts for the prosecution, including the local medical examiner, a child-protection pediatrician, a pediatric ophthalmologist, a pediatric radiologist, two pediatric critical-care physicians, and a specialist in osteogenesis imperfecta (OI), a disease of the bones. All agreed that Annie had died from abusive head trauma. Many said shaking was involved. Defense attorney Cedric Ashley opened his case last week by calling Dr. Zhongxue Hua, a respected medical examiner from a neighboring jurisdiction. I can’t find coverage of Dr. Hua’s testimony in the English-language press, but I’m told he said that Annie had signs of mild OI and unusual heart findings. 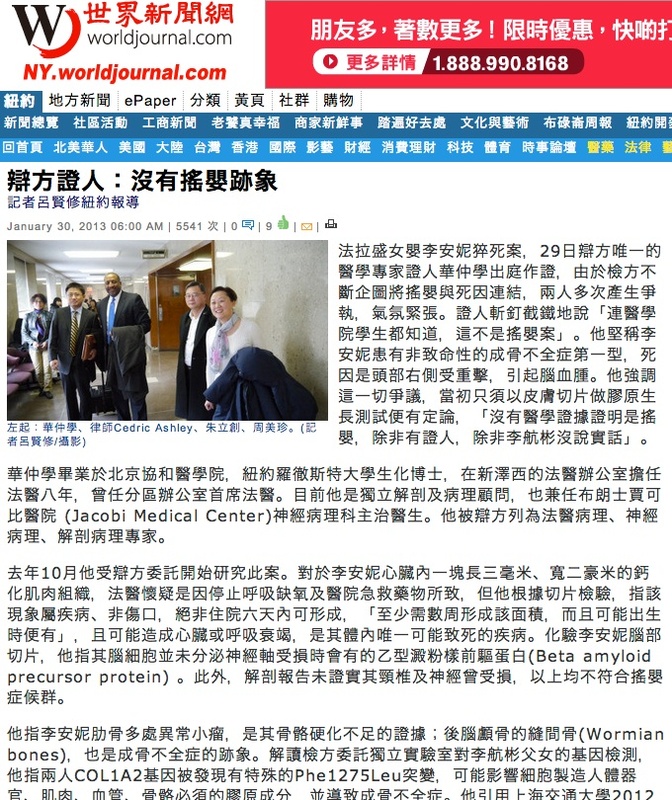 The Li case has received daily coverage in three Chinese-language newspapers in New York, and periodic coverage in the English-language press. The New York Times quoted prosecutor Leigh Bishop’s saying after the trial that the verdict was “perfectly reasonable,” because “we didn’t have enough information about his mind-set at the time he inflicted the injuries” to prove murder. Several jurors said that they felt an obligation to see Mr. Li punished for Annie’s death, but that they could not arrive at a guilty verdict on the murder charge because they lacked the evidence to decide that her injuries resulted from a depraved mental state on Mr. Li’s part, a finding required for guilt on that charge. “We spoke up for the baby and said, ‘You can’t do this,’ ” one juror, Luisito Castro, said. Ashley characterized the outcome as a partial victory. “He’s not facing 25 years to life,” Ashley told reporters. The manslaughter charge carries a maximum sentence of 5 to 15 years in prison, and a minimum of 1 to 3 years. Li has already spent nearly 5 years in custody—4 years and 10 months—while waiting for trial. The Lis have both denied that either of them did anything to harm Annie—and their community agrees. Their defense was paid for by donations from supporters, many of them other Chinese immigrants. Hang Bin and Ying Li, and their community, were drawn unexpectedly into this arena, but the attorneys and medical experts at Hang Bin’s trial were seasoned veterans. Prosecution witness Dr. Carole Jenny, for example, is one of the major forces behind the relatively new medical-board speciality of child-protection pediatrics. A former prosecutor, Cedric Ashley is on top of the medical arguments, making him a rare defense attorney in this complex arena. Prosecutor Leigh Bishop—whose actress friend Katie Holmes made headlines in early January by stopping in at the courthouse to hear opening statements—was on the faculty at last fall’s Twelfth International Conference on Shaken Baby Syndrome/Abusive Head Trauma. In 2007 Bishop successfully prosecuted Yoon Zapana, whose son Victor Zapana published an essay about his mother’s conviction in the November 27, 2012, issue of The New Yorker. In the Zapana trial, as in the Li trial, the defense called a single medical expert while Bishop called a spectrum of medical specialists. I’m reminded of an email I received about a year ago, the reflections of a defense expert who found himself outgunned at a similar trial. While I have heard of cases won with only one or even zero defense experts, I think it’s rare. I don’t know of any data on the subject, but my observation is that a defense team that includes the full range of specialists is a better bet, as illustrated by a series of exonerations earlier this winter and the Russ Van Vleck trial in 2011. If you are unfamiliar with the debate surrounding shaken baby syndrome in the courtroom, please see the home page of this site. Hang Bin Li, don’t give up! I’m so sorry you have to go through this! I am embarrassed at our American system of “justice.” Nevertheless, I think that one should never admit to anything one has not done, because after fighting all this time, an admission only gives the other side FAR more power, ESPECIALLY after fighting this long time. And an admission allows Social Services to follow you ALL the rest of your life. If you stick by your guns, you will be a hero. Maintain your innocence at all times. We are all fighting the battle on our own fronts. Eventually we will come together on it. We didn’t have a jury, but in our own case, the “expert” witness for the other side CLEARLY had very little understanding of physics. This is just one of many problems of non-expertise I found in her testimony and felt sick that her “expert” testimony was accepted above that of our own experts. The following is taken directly from the transcript. It’s a bit long, but I think it’s worth reading to see how silly and UNeducated this particular “expert” witness was, and the Court accepted it! Q. Now these acceleration-deceleration injuries — is it just from taking a child and shaking it back and forth? Or are there other ways to have an acceleration-deceleration injury? Q. Can you describe some examples of acceleration-deceleration injuries other than what I know everyone has in their mind, which is the classic shaking the baby back and forth? A. Well, I think there’s a lot of acceleration-deacceleration that children go through that don’t result in these kinds of injuries. And I think if you actually look at some of the physics…it DOES take a certain amount of force to cause the damage. And the most common, the only thing that causes a severe enough acceleration-deacceleration in kids this age, resulting in these kinds of injuries, is an automobile accident. Because you have the speed associated with the fast deceleration from the accident, you know. There’s some talk about deceleration from the accident and impact, too, as well. But… and that MAY contribute to it. (Repeat: Impact MAY contribute to damage!) But in those cases you more often find that there’s some external trauma to the scalp or something when you’re looking at those kinds of contact. Q. So in your opinion, the most consistent diagnosis with the history and these injuries is in acceleration-deceleration injury? Q. Which if it wasn’t an automobile accident would be an intentional injury? Q. Now, how certain are you at this point of this diagnosis? A. Well, I can’t figure out any other constellation of medical or accidental injuries that would result in presenting in this manner. Does that sound like an “expert” to you? 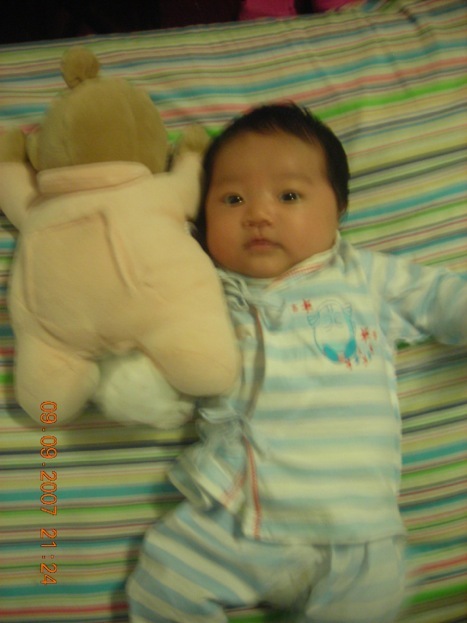 Our baby had NO outside marks of any kind on him. Nor was any inner trauma found to support the diagnosis of shaken baby. For someone to think that you can grab a baby and shake the heck out of it and not leave a single mark, scratch, bruise, swollen neck or traumatized spinal column is just completely ignorant! You can’t even hold a book “lightly” and shake it without it falling out of your hands! And anyone irritated enough to violently shake a baby, will they delicately hold the baby at the same time? This is just so obviously wrong, I can’t believe people accept this! And to think that you only see injuries “like this” in auto accidents where there is IMPACT and OUTSIDE TRAUMA, but if there is no outside trauma and no impact, then it must be shaken baby is ludicrous. I believe most of the judges also don’t have enough understanding of the science, so that they can be snowed by fancy words, too! And the prevailing belief is that the shaken baby diagnosis is legitimate and sure, so it’s much easier for them to lean that way in their judgments. I believe Li who could never hurt his baby girl even though I have never met him before. However, I would convince him to take the lesser charge in order to have his life back sooner rather than later. Life is short and he should NOT pay for those so called righteousness’ fault. It hurts too much! I apologize for advising the passive choice.